Duct tape, a cheap and essential part of any homeowners' tool box, might become a standard piece of airline security gear after a flight crew used it to restrain an unruly passenger. The Charlotte Observer reported that a flight crew resorted to the use of duct tape to restrain a New York passenger who had become disruptive on a flight Saturday from Puerto Rico to Chicago. Authorities alleged that Maria Esther Castillo of Oswego, NY slapped a crew member on the buttocks, pulled the hair of a blind passenger, spewed profanity and generally invaded the personal space of other passengers by touching and jabbing them. Oswego was arrested by federal authorities and charged with interfering with the operations of a flight crew. 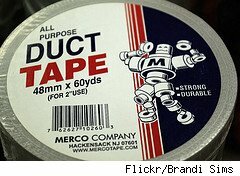 On my home improvement radio show, we frequently caution that duct tape shouldn't actually be used for taping heating ducts (it dries out and falls off). However, it's good for hundreds of other uses and apparently more than effective for taping down a loud drunk to her airline seat. Tom Kraeutler is the Home Improvement Editor for AOL and co-author of My Home, My Money Pit: Your Guide to Every Home Improvement Adventure. He delivers expert home improvement tips each week as host of The Money Pit, a nationally syndicated home improvement radio program.